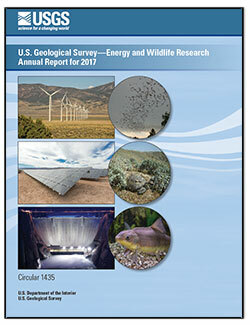 How are bats affected by wind turbines? Dead bats are found beneath wind turbines all over the world. It’s estimated that tens to hundreds of thousands die at wind turbines each year in North America alone. Unfortunately, it’s not yet clear why this is happening. It’s possible that wind turbines interfere with seasonal migration and mating patterns in some species of bats. 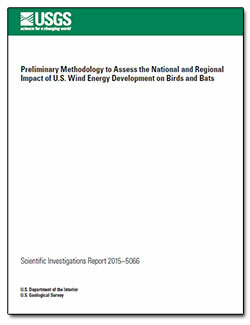 More than three quarters of the bat fatalities at wind turbines are from species known as “tree bats,” which tend to migrate long distances and roost in trees. These bats migrate and mate primarily during late summer and early autumn, which is also when the vast majority of bat fatalities at wind turbines occur. It’s also possible that bats mistake slow or stopped turbine blades for trees. 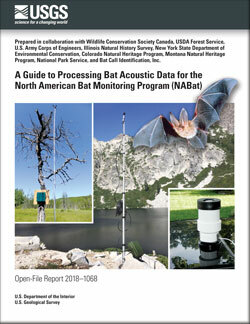 Learn more at the USGS Bats website. Why is it important to know the locations of wind turbines? What should I do if I find dead or dying bats, or if I observe bats with signs of White-nose Syndrome? Diffendorfer, James E.; Beston, Julie A.; Merrill, Matthew D.; Stanton, Jessica C.; Corum, Margo D.; Loss, Scott R.; Thogmartin, Wayne E.; Johnson, Douglas H.; Erickson, Richard A.; Heist, Kevin W.
Diffendorfer, J.E., Beston, J.A., Merrill, M.D., Stanton, J.C., Corum, M.D., Loss, S.R., Thogmartin, W.E., Johnson, D.H., Erickson, R.A., and Heist, K.W., 2015, Preliminary methodology to assess the national and regional impact of U.S. wind energy development on birds and bats: U.S. Geological Survey Scientific Investigations Report 2015–5066, 40 p., http://dx.doi.org/10.3133/sir20155066. Our Nation works to advance renewable energy and to avoid conflicts with and conserve wildlife. Certain bats may be approaching wind turbines after mistaking them for trees, according to a study published in the Proceedings of the National Academy of Sciences. Spectrograph of an acoustic recording from the western small-footed myotis (Myotis ciliolabrum) noting shape and frequency of call with photo of the western small-footed myotis and cartoon representation of this bat echolocating below. While mother bats are out foraging, the young bats huddle together in groups that biologists call a cuddle. Bat emergence, Paul Cryan, USGS photo. Bats emerging from the trees in the early evening sky. A bat that was killed by a wind turbine laying in the grass. Wind-power development in the United States is increasing exponentially, with proposals to provide 20% of the country's total power by 2030.